We finally have a trailer for Brie Larson's directorial debut Unicorn Store. This one has been in the works for a few years now, with the Oscar-winning actress having completed the movie back in 2017. It even screened that year at the Toronto International Film Festival. Netflix has, at long last, stepped in to distribute it and it's coming our way next month. While a very different movie, it also serves as a Captain Marvel reunion, with both Larson and Samuel L. Jackson starring in the love letter to everyone's inner child. The trailer is quite colorful, literally, and it paints a picture of a woman who has struggled to share her artistic side with the world. So, instead, she saddles up with corporate America, rather begrudgingly. But she gets an unexpected shake up thrown her way from a very lively Samuel L. Jackson in the form of, yes, a unicorn. We also get a rather nice, "she said the title of the movie" moment in there for good measure. Overall, it looks very fantastical, emotional and a little off the beaten path. 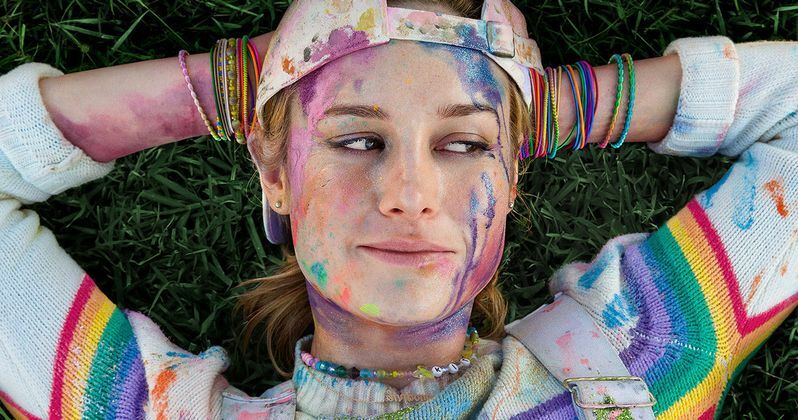 Unicorn Store centers on Kit (Brie Larson), a lonely twenty-something young adult with big dreams who is reluctant to leave her childhood behind to, instead, fully embrace adulthood. But when she fails out of art school, Kit is forced to move back in with her parents and take a boring office job. Just when she's finally come to grips with putting her Care Bears aside and become a real adult, a mysterious salesman (Samuel L. Jackson) enters the picture and offers to give her childlike heart its greatest desire, a unicorn. The cast also includes Joan Cusack and Bradley Whitford. It's produced by Lynette Howell Taylor, David Bernad, Brie Larson, Paris Kasidokostas-Latsis, Terry Dougas and Venom director Ruben Fleischer. Executive producers include Jean-Luc De Fanti, Nathan Kelly, Samantha McIntyre and Anne Woodward. Samantha McIntyre penned the screenplay. Brie Larson, in an interview from 2017 with IndieWire, explained that she knows the movie isn't for everyone, but hopes that the right people find their way to it. "I know that the film isn't for every person. But I hope that for the people that I did make it for, it resonates with them as a way of saying, 'We need these voices that are unique and different.'" Those who have screened the movie are a bit mixed on it. It currently has a 68 a percent critical approval rating on Rotten Tomatoes, to go along with a 46 percent audience rating. But, as we've seen, those scores can be a little unreliable. In any case, since Netflix picked this one up, it will cost nothing additional for subscribers to watch it, accept for their time. Unicorn Store drops on April 5. Be sure to check out the new trailer, as well as the new trailer, from Netflix streaming services below.